Asked only once at a Senate hearing Thursday about the fake security incident that’s needled his agency for more than a year, the chairman of the Federal Communications Commission, Ajit Pai, acknowledged for the first time knowing secretly for several months that his office likely fed U.S. lawmakers false information. 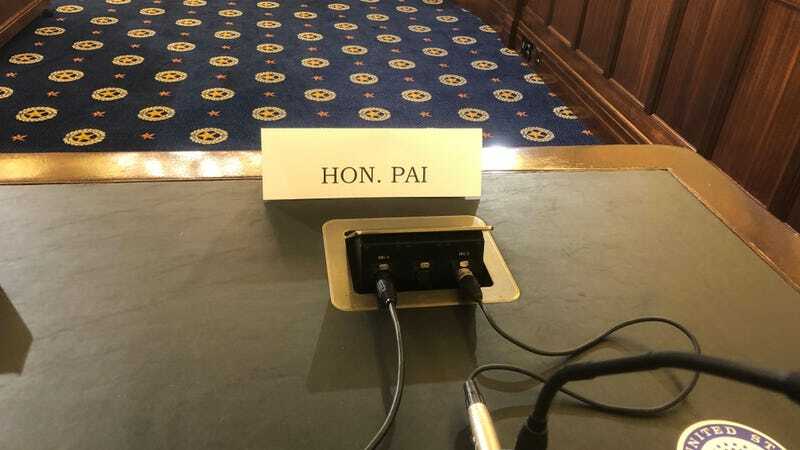 At an oversight hearing largely dominated by discussions about the state of the nation’s broadband and cellular infrastructure, Pai explained that he was urged by the commission’s inspector general (IG) to keep under wraps details of an ongoing investigation. “Do not say anything to anyone,” Pai told the committee, regarding the request he says he received from the IG’s office. Pai then asked lawmakers to put themselves in his shoes. “It’s a difficult position to be in,” he said. Released on August 8, the IG report found that senior FCC officials had misled Congress and the American public by first announcing, and later defending in letters to lawmakers, a claim that distributed denial-of-service (DDoS) attacks had crippled the commission’s comment system last May, amid efforts by majority Republican members to roll back Obama-era net neutrality protections. Investigators concluded after seven months that the DDoS claims were, at best, “a rush to judgement” and, moreover, the result of a failure to conduct any kind of actual analysis that would be required to prove a cyberattack had occurred. “Once we knew what the conclusions were it was very hard to stay quiet,” Pai told the Senate Committee on Commerce, Science, and Transportation. The hearing was attended by the full commission—one Democrat and three Republicans, including Pai, who was appointed to lead the FCC by President Trump early last year. Senator Brian Schatz, a Democrat and the only lawmaker to bring up the IG report on Thursday, said it was “difficult to digest” that Pai had not been more critical of his CIO’s assessment, given the unprecedented number of comments received by the FCC after Oliver’s first net neutrality segment in 2014. “I think a lot of people’s first instinct was it didn’t make any sense,” Schatz said of Bray’s diagnosis. “My assumption was it was John Oliver’s viewers,” said Pai, adding that he was informed otherwise by the CIO, whom he said claimed “99 percent” confidence in identifying malicious actors behind the comment system’s downtime. The FCC inspector general, David Hunt, did not immediately respond to a request for comment. The FCC investigation, started to examine the source of the purported attack, shifted in December after investigators became concerned that three FCC officials, including Bray and the agency’s chief information security officer, Leo Wong, may have committed a federal crime by feeding false information to Congress. The Justice Department, where the case was referred in January, declined to prosecute the officials; it has declined to say why. Telling no one, the chairman has known all year. Update, Sept. 4: In response to questions for the record submitted by Rep. Debbie Dingell, now obtained by Gizmodo, FCC Chairman Ajit Pai acknowledged that aware of the inspector general’s findings prior to a House oversight hearing on July 25th. Asked if the inspector general has advised him in writing not to “correct the public record and your misrepresentations to Congress,” Pai replied that the request was not documented, but given orally.